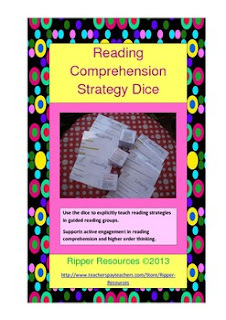 The latest version of the top selling Reading Comprehension Dice - Bright Dots version. Use the dice in small group guided reading sessions to encourage interaction, discussion and higher order thinking. The die template includes: Predicting, Visualising, Inferring, Questioning: Thick and Thin Questions, Clarifying and Connecting (text:text, text:self, text: world) and comes with prompt cards for each strategy. U.S. and Australian spelling versions are included.